It studies the content marketing performance of clients with Growth Machine and Bell Curve (my company) â€” two marketing agencies who have helped grow Perfect Keto, Tovala, Framer, Crowd Cow, Imperfect Produce, and over a hundred others. 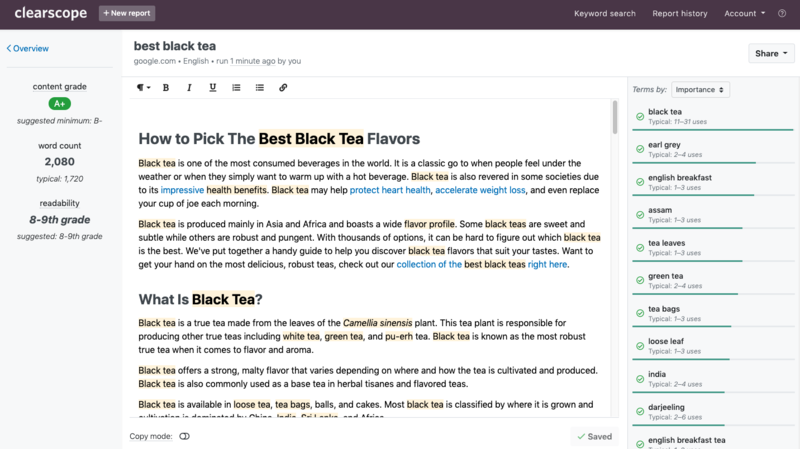 Youâ€™re about to see how most startups manage their blogs the wrong way. In the past, Google wasnâ€™t skilled at identifying and promoting high quality articles. Their algorithms were tricked by low-value, â€œcontent farmâ€� posts. Today, Google is getting close to delivering on its original mission statement: â€œTo organize the world’s information and make it universally accessible and useful.â€� In other words, they now reliably identify high quality articles. How? By monitoring engagement signals: Google can detect when a visitor hits the Back button in their browser. This signals that the reader quickly bounced from the article after they clicked to read it. 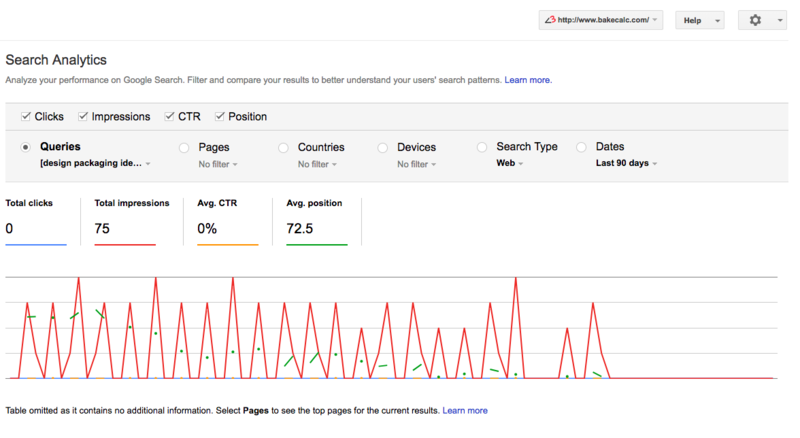 For example, below is a screenshot of the (old) Google Webmaster Tools interface. It visualizes this quality assessment process: It shows a blog post with the potential to rank for the keyword â€œdesign packaging ideas.â€� Google initially ranked it at position 25. In studying our clients, weâ€™ve identified four rules for writing engaging posts. 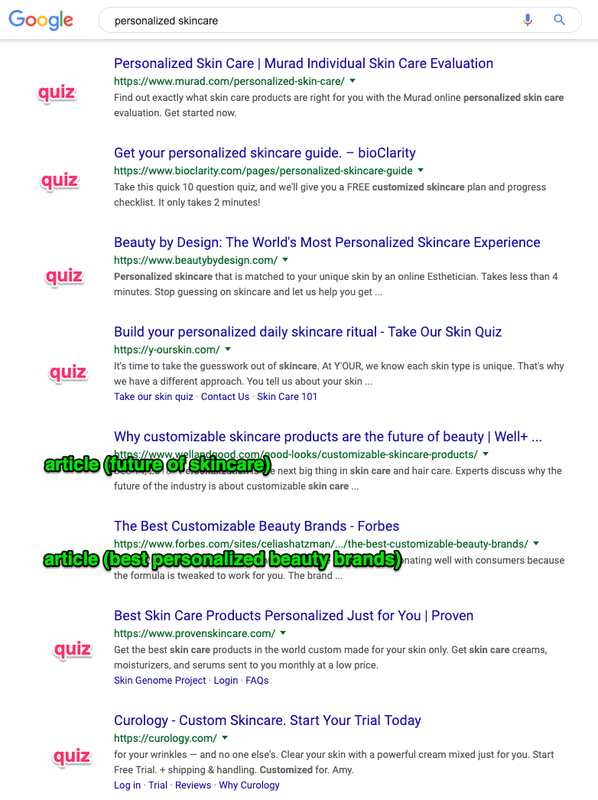 So if you donâ€™t perform a check like this before writing an article on â€œpersonalized skincare,â€� thereâ€™s a good chance youâ€™re wasting your time. Because, for some queries, Google has begun prioritizing local recommendations, videos, quizzes, or other types of results that arenâ€™t articles. Make your content deliver on what your titles imply a reader will see. Otherwise, readers bounce. Google will then notice the accumulating bounces, and youâ€™ll be penalized. 3. Write articles that conclude the searcherâ€™s experience. Meaning, if they read your post then donâ€™t look at other Google result, Google infers that your post gave the searcher what they were looking for. And thatâ€™s Googleâ€™s prime directive: get searchers to their destination through the shortest path possible. Be like them, and get out of the readerâ€™s way. All our best-performing blogs do this. In going through our data, the second major learning was about â€œbacklinksâ€�, which is marketing jargon for a link to your site from someone elseâ€™s. Four years ago, the SEO community was focused on backlinks and Domain Ranking (DR) â€” an indication of how many quality sites link to yours (scored from 0 to 100). At the time, they were right to be concerned about backlinks. Today, our data reveals that backlinks donâ€™t matter as much as they used to. They certainly help, but you need great content behind them. Most content marketers havenâ€™t caught up to this. The implication is that, even without backlinks, Google is still happy to rank you highly. Consider this: They donâ€™t need your site to be linked from TechCrunch for their algorithm to determine whether visitors are engaged on your site. Remember: Google has Google Analytics, Google Search, Google Ads, and Google Chrome data to monitor how searchers engage with your site. Believe me, if they want to find out whether your content is engaging, they can find a way. They donâ€™t need backlinks to tell them. Our data shows they still provide value, just much less. Notably, they get your pages â€œconsideredâ€� by Google sooner: If you have backlinks from authoritative and relevant sites, Google will have the confidence to send test traffic to your pages in perhaps a few weeks instead of in a few months. 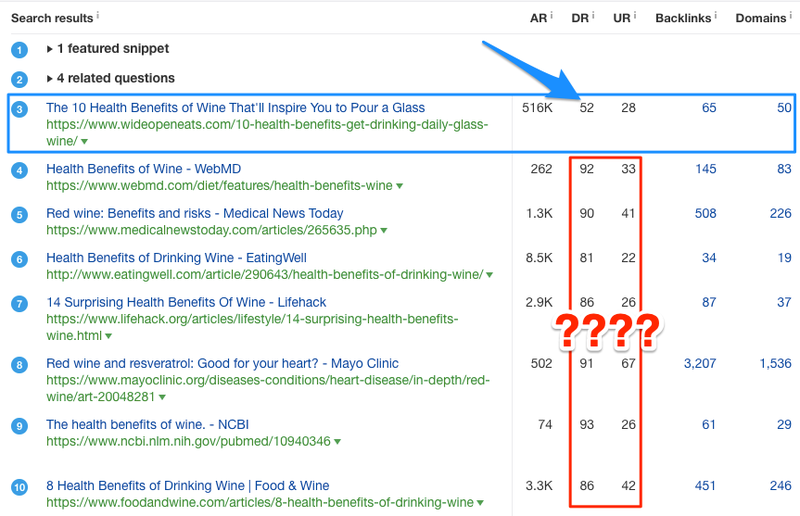 Hereâ€™s what I mean by â€œtest traffic:â€� In the weeks after publishing your post, Google notices them then experimentally surfaces them at the top of related search terms. They then monitor whether searchers engage with the content (i.e. donâ€™t quickly hit their Back button). If the engagement is engaging, theyâ€™ll increasingly surface your articles. And increase your rankings over time. To increase the ratio at which readers take the short and medium paths, optimize your blog postsâ€™ copy, design, and calls to action. Weâ€™ve identified two rules for doing this. Also, the further a reader gets into a good article, the more familiarity and trust they’ll accrue for your brand, which means theyâ€™re less likely to ignore your pitch once they encounter it. Instead, plug your product using a normal text link â€” styled no differently than any other link in your post. Woodpath, a health blog with Amazon products to pitch, does this well. Finally, our best-performing clients focus less on their Google Analytics data and more on their readersâ€™ full journeys: They encourage readers to provide their email so they can follow up with a series of â€œdripâ€� emails. Ideally, these build trust in the brand and get visitors to eventually convert. They â€œretargetâ€� readers with ads. This entails pitching them with ads for the products that are most relevant to the topics they read on the blog. (Facebook and Instagram provide the granular control necessary to segment traffic like this.) You can read my growth marketing handbook to learn more about running retargeting ads well. Hereâ€™s why retargeting is high-leverage: In running Facebook and Instagram ads for over a hundred startups, weâ€™ve found that the cost of a retargeting purchase is one third the cost of a purchase from ads shown to people who havenâ€™t yet been to our site. Itâ€™s possible for a blog with 50,000 monthly visitors to earn nothing.